Dimmer Switches can be used in a wide variety of rooms throughout your home and help add a bit of versatility to an otherwise one-use room. With the use of a dimmer switch, a family room can quickly turn into a party room, movie room or game room. Dimmers allow you to be in control of how much light each room gets at any given time. Yes, you can use a dimmer switch on low voltage lights if you use an appropriate low voltage dimmer. Magnetic low voltage lights require a magnetic dimmer, and electronic low voltage lights require an electronic dimmer. Line voltage lights may also be dimmed with the low voltage lights if they are on the same switch. 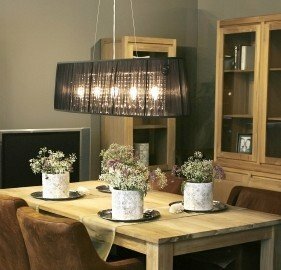 For instance, if you have a dining table chandelier with low voltage recessed lighting on either side, they may all be dimmed with the low voltage dimmer. Warning: Low voltage lighting may be damaged if the dimmer used is not a low voltage dimmer.